The yard sale was a tad weird…there was stuff outside on tables, but you were also welcome to wander into the garage which was jam packed…but it was so jam packed that you couldn’t get to things. I saw something on a far shelf I wanted to look at, but there was no way to get to it. Why hadn’t this stuff been hauled outside too? Or at least made accessible? 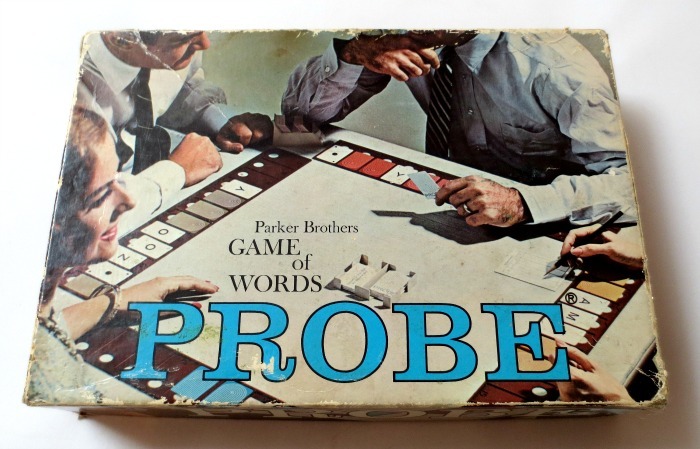 I also bought this 1964 “Probe” game, but probably should have given it a pass. The box is in rough condition and the instructions are stained, but look at the guys on the box…they are playing a game wearing ties!! Next stop, was an estate sale in a tiny cottage. It was day two of a three-day sale. There were still exquisite little things left but even with 20% off, most were priced too high for me to resell. I did decide to buy one piece of the Quimper ware. I knew it was a “good name” and collectible, but the purchase was a shot in the dark for me. After I got home I found a great site, oldquimper.com, that helped me decode the markings on the back. (My Petit Breton salad plate dates from 1968-1983.) But since Quimper pieces have been produced since the 1700s and continue today, you need to be knowledgable and savvy to get the rare pieces. 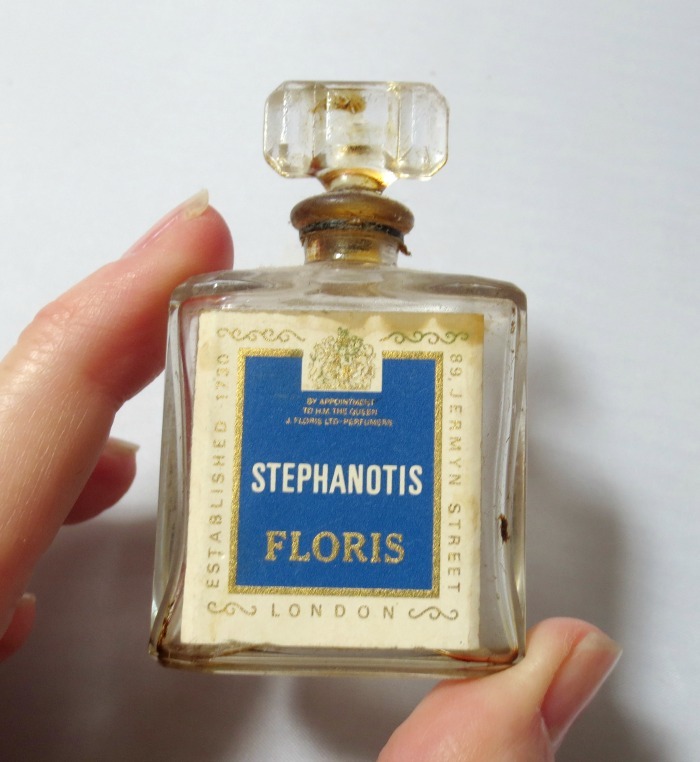 The sale also had little perfume bottles…another area I know nothing about, so I bought one of the inexpensive ones, a Floris London, to spur my interest in doing some research. There’s no perfume left and the bottle’s pretty manky, but it has a nice ground stopper. If it turns out to be worthless, I might clean it up and use it for my Egyptian musk. 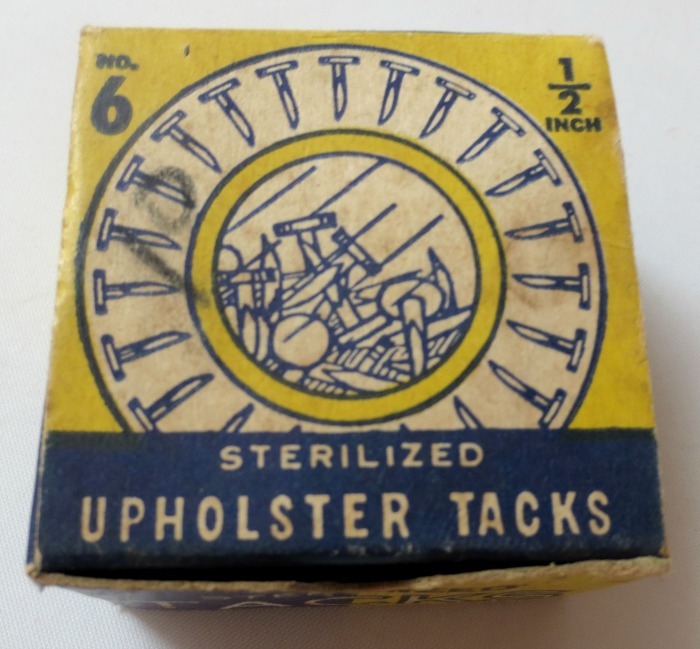 And my most random, pointless purchase…a little box of vintage upholster tacks. I liked the graphics on the box! My last purchase falls in my “lesson learned” category. 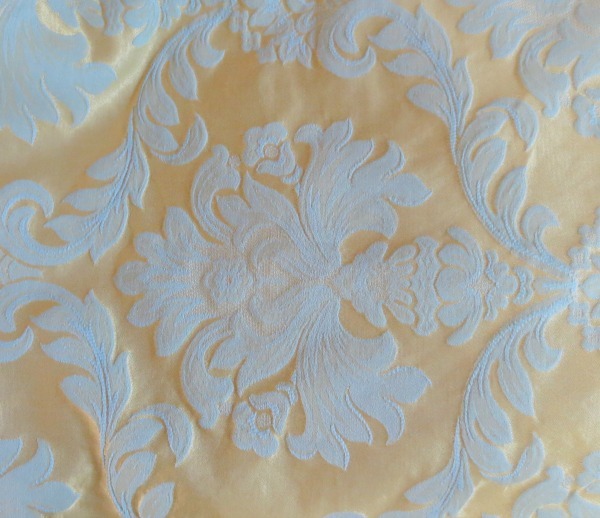 I was attracted to this vintage brocade fabric remnant in gold and blue. After I bought it, I untaped it to take a closer look (thankfully no holes or stains) but I discovered it had a STRONG musty smell. Oh jeez. At home I soaked it in detergent…three times! Then I soaked it in diluted white vinegar and rinsed it. It still smells! There are other treatment possibilities, like steam or a vodka spritz. (After all this I need a vodka spritz!) I would like to get this smelling fresh and clean so I can sell it, though I have to admit it’s barely worth the effort. This remnant, though pretty, is just big enough for a pillow. But I’m not giving up yet. So the lesson is: Always do a SNIFF test before you buy! And if you’ve had success getting musty smells out of fabric do tell me your secret! I’ve had success with vodka to get rid of musty smells. Full strength from a spray bottle. I did have to apply it twice over 2 days. Good luck! 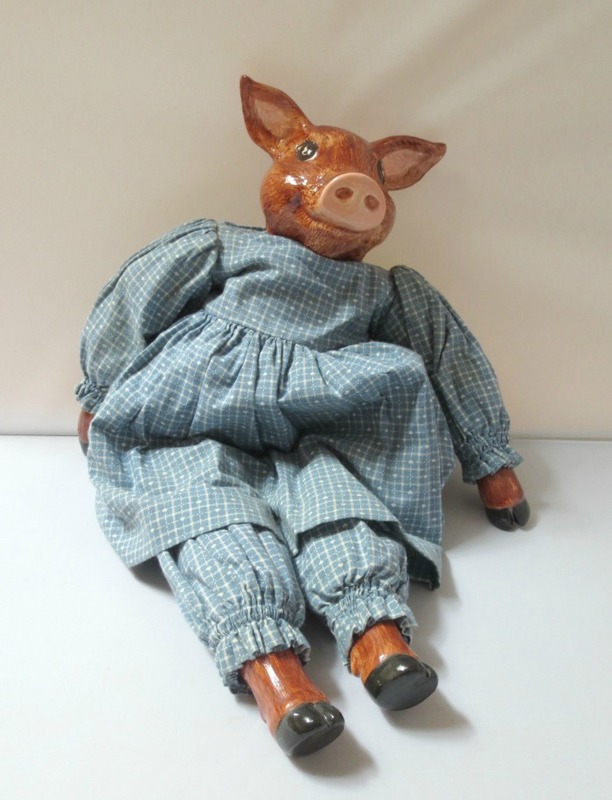 Karen, I do enjoy reading about your finds and what you will/can do with them – what about writing a book based on your experience- sort of ‘introduction to thrifting’ the does and don’ts for people starting out collecting vintage? I’d love to read that book. Great post. I love the worthless perfume bottle. Good luck with the stinky fabric. I have made that mistake several times, but just threw it in the machine and took my chances. Sometimes it works, sometimes it doesn’t. I have seen vintage fabric for sale that shops put cedar chips in the display. I assume it’s to mask musty odors.